Precision Cleanrooms would like to thank everyone for coming out and visiting our booth at the ISPE Boston Area Chapter Product Show! It was a great turn out! If you have any questions or comments regarding cleanrooms, please do not hesitate to call us! ISPE is an international society for professionals involved in the engineering and manufacture of pharmaceuticals and related products. 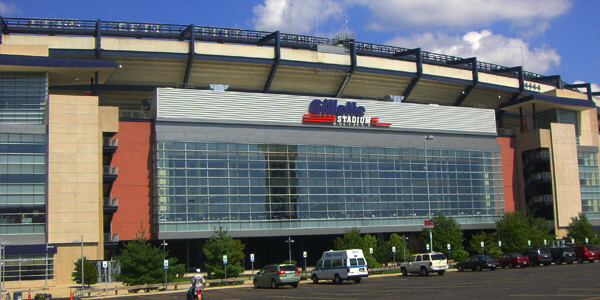 Join us for the 25th Anniversary ISPE Boston Area Chapter Product Show at Gillette Stadium in Foxborough on October 5, 2016! 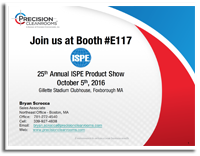 Visit Precision Cleanrooms, a division of Precision Environments, Inc. at the ISPE Boston Area Chapter Product Show. With almost 30 years of delivering industry leading cleanroom environments, Precision Environments, Inc. delivers world class turnkey aseptic cleanroom design, engineering and construction services. We look forward to meeting you at theISPE Boston Area Chapter Product Show to discuss your next cleanroom project. Contact Us to setup a time to meet during the event. ISPE, the International Society for Pharmaceutical Engineering, is the world’s largest not-for-profit association serving its Members by leading scientific, technical and regulatory advancement throughout the entire pharmaceutical lifecycle. ISPE is committed to the advancement of the educational and technical efficiency of its members through forums for the exchange of ideas and practical experience. All scientific and technical areas of the pharmaceutical manufacturing industry are represented among the ISPE Membership. Engineers, microbiologists, chemists, QA/QC, production, process development, pharmacists, regulatory and training personnel, academia, suppliers, and other professionals contribute their expertise to the industry through their participation in ISPE activities. ISPE’s Core Members are pharmaceutical professionals who use expert knowledge to create high-quality, cost-effective GMP solutions. Their Baseline® Guides are relied on globally by industry and regulators to define the industry standards for design, construction and operation of pharmaceutical manufacturing facilities. ISPE’s training, conferences and Knowledge Networks give professionals solutions for their needs and connect them with other professionals to share best practices. They understand how to design, build, qualify, license, operate and maintain these complex facilities, including those that manufacture active pharmaceutical ingredients, finished dosage forms, delivery systems and packaging. Through their branded expertise in these areas we have deep technical knowledge that is applied in a practical manner. They lead and facilitate the development of next generation process technologies and innovative technical solutions. On matters of regulation, their focus is on those requirements that impact — or will impact — the licensing of facilities, manufacturing processes and operations and the sustainability of the supply chain over the product lifecycle. ISPE has developed relationships with and continue to provide key access to major regulatory agencies at the most senior levels. ISPE aims to offer increasing and unparalleled value for Members, companies and stakeholders globally and across all constituent parts of the industry. The end result will be the continued improvement and transformation of the pharmaceutical manufacturing industry to better ensure the availability of quality medicines to patients around the world.